ELA.RF.3.3a: Identify and know the meaning of the most common prefixes and derivational suffixes. ELA.RF.3.4c: Use context to confirm or self-correct word recognition and understanding, rereading as necessary. 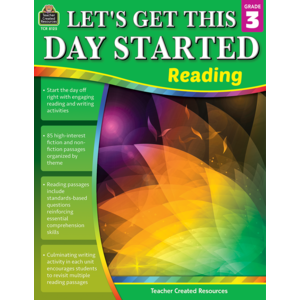 ELA.RF.3.4a: Read on-grade-level text with purpose and understanding. ELA.W.3.1c: Use linking words and phrases (e.g., because, therefore, since, for example) to connect opinion and reasons. ELA.W.3.1b: Provide reasons that support the opinion. ELA.W.3.1a: Introduce the topic or text they are writing about, state an opinion, and create an organizational structure that lists reasons. ELA.W.3.2b: Develop the topic with facts, definitions, and details. ELA.W.3.2a: Introduce a topic and group related information together; include illustrations when useful to aiding comprehension. ELA.W.3.3b: Use dialogue and descriptions of actions, thoughts, and feelings to develop experiences and events or show the response of characters to situations. ELA.W.3.3a: Establish a situation and introduce a narrator and/or characters; organize an event sequence that unfolds naturally. ELA.L.3.1d: Form and use regular and irregular verbs. ELA.L.3.1a: Explain the function of nouns, pronouns, verbs, adjectives, and adverbs in general and their functions in particular sentences. ELA.L.3.2c: Use commas and quotation marks in dialogue. ELA.L.3.3a: Choose words and phrases for effect. ELA.L.3.4a: Use sentence-level context as a clue to the meaning of a word or phrase. ELA.L.3.4b: Determine the meaning of the new word formed when a known affix is added to a known word (e.g., agreeable/disagreeable, comfortable/uncomfortable, care/careless, heat/preheat). ELA.L.3.5a: Distinguish the literal and non-literal meanings of words and phrases in context (e.g., take steps).